(Leah Hogsten | The Salt Lake Tribune) Utah Jazz guard Donovan Mitchell (45) watches the game from the sidelines as the Utah Jazz host the Toronto Raptors, Monday, Nov. 5, 2018 at Vivant Smart Home Arena. After missing Monday night’s loss to the Toronto Raptors, Donovan Mitchell is likely to return to action against the Dallas Mavericks Wednesday. Mitchell’s status has been changed to “probable” for Wednesday’s contest. Mitchell has missed two of the least three Jazz contests with right hamstring tightness (Friday vs. Memphis) or a left ankle sprain (Monday vs. Toronto). The Jazz lost both games. 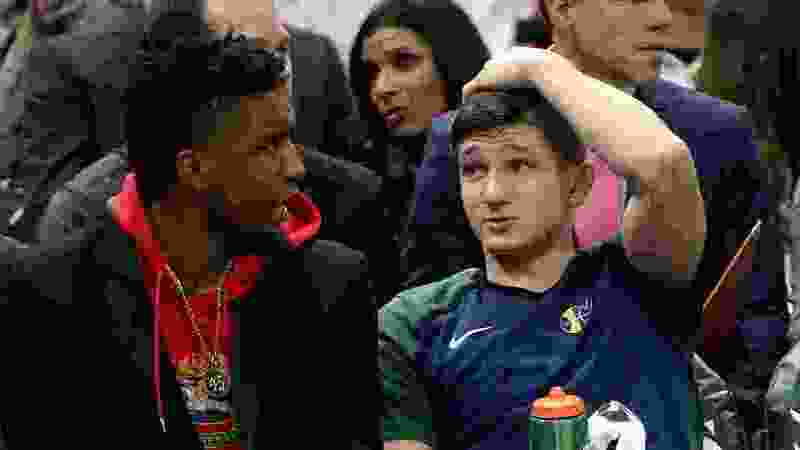 After Tuesday’s practice, Mitchell could be seen participating in one-on-one drills with Grayson Allen, Ricky Rubio, Georges Niang, and Thabo Sefolosha. Mitchell looked relatively unencumbered by the injury, though he did vow to start taping his ankles after spraining his in the fourth quarter in Denver. The only other player on the Jazz’s injury report is Raul Neto, who remains out due to a hamstring strain.